Highland Park — It’s been 35 years since Chicano muralist Frank Romero painted “Going to the Olympics” — a celebration of the city’s car culture — that spreads for more than 100 feet across a wall on the 101 Freeway in Downtown. Now, a new, smaller mural inspired in part by the same piece is to be recreated on a municipal parking lot in Highland Park. 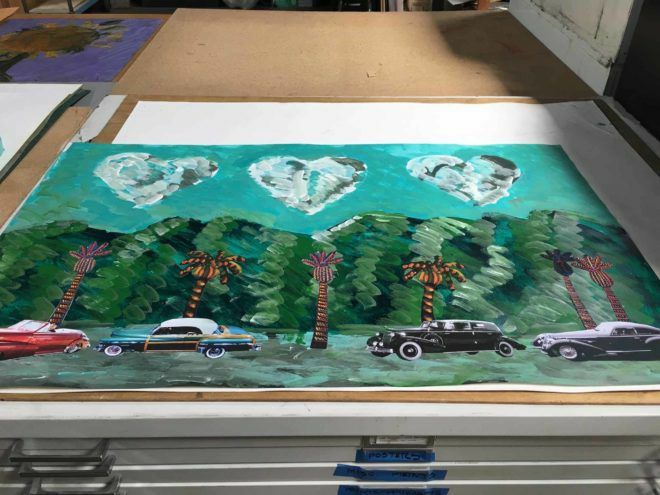 The project –a mural of palm stress, cars and heart-shapes — will cost a total of $40,000, according to Felicia Filer, public art division director from the city’s Department of Cultural Affairs (DCA). For redoing it, the city would contribute $5,000 in Council Civic Funds and $5,000 in mural funding. The rest of the funding would come from private donations. The mural – measuring eight feet by 35 feet – would go up on the southeast side of Municipal Parking Lot 638, along South Avenue 58. This would help replace murals on city-owned lots that were painted over after they had become heavily tagged by graffiti, Filer said.